Chances are you have some type of natural stone in your house. Whether it’s a marble countertop or backsplash tiling in your kitchen, natural stone adds a unique and classic feel to the environment. The most popular natural stones that homeowners choose to add to their space, whether that is the kitchen or the bathroom, are marble, granite, slate, limestone, and travertine, just to name a few. Adding any type of stone or tiling to any area of your home is no easy feat; it’s an investment and one that you will enjoy for years to come. That said, knowing how to properly care for and maintain natural stone, no matter where it is in your house, is essential. There are certain cleaning habits that you can get into and do on a daily and/or weekly basis, like wiping down any dust, dirt, grime, or spills that have happened, as well as steering clear of any abrasive cleaning solutions. But when it comes down to it, hiring a professional natural stone cleaner will provide you with peace of mind knowing that the tiling or surface will last for many, many years. Depending on the type of natural stone you choose, the tasks required to keep it well-maintained and in good condition can be extensive. A professional will have the knowledge and experience that’s necessary to effectively, efficiently, and thoroughly deep clean any type of natural stone that is in and/or around your house. You might feel hesitant to hire a service to clean surfaces in your house because of the cost, but it’s important to keep in mind that you could very well be saving money in the long-run by calling on the professionals. If not properly cared for, natural stone can become damaged, which means that sooner or later you’ll have to put some more money down for heavy maintenance or a remodel. 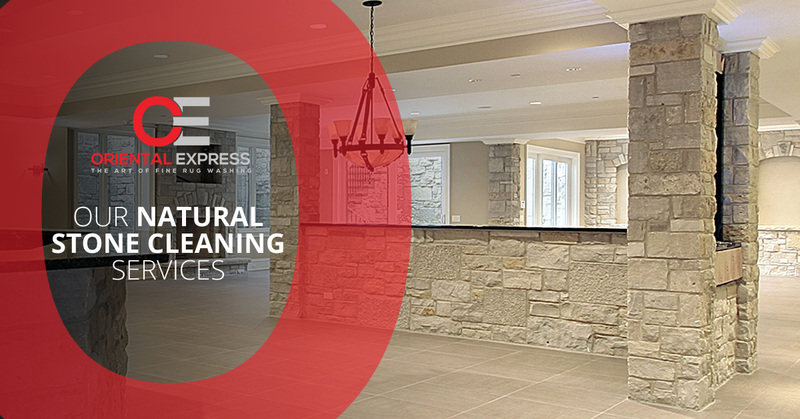 By choosing to have a professional do routine cleaning, you’re maintaining the quality and the life-span of the natural stone surface you cherish in your home. Here at Oriental Express, we specialize in rug repair and cleaning. But in addition to our Persian rug repair and cleaning services, we offer natural stone cleaning, as well as cleaning services for tiling, upholstery, and draping. The special care and attention to detail that we put into our rug repair and cleaning services is no different than what we devote to our natural stone cleaning services. If you’re in the Las Vegas area and are looking for a natural stone maintenance services, don’t hesitate to contact Oriental Express today.